This week I organized my wrapping paper and gift bags which Rachel Anne of Home Sanctuary suggested to us a couple of weeks ago as one of our daily "Small Things" challenges. I finally got to it! She inspires me to do so much! 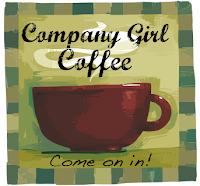 You can hook up with RA at her blog anytime, but she hosts a special Company Girl Coffee every Friday. Another woman who inspires me is Marcia, the Organising Queen. Marcia posts daily tips on organization and decluttering almost daily, and she hosts a special edition of Decluttering on Fridays. I cleaned out my sock drawer. It didn't take long, but it was productive. I tossed 12 (yes, a dozen) mate-less socks, gave three pairs of athletic socks I don't like to my son (whose foot is as big or bigger than mine already), one pair to my daughter, and two to donate. CD's - neat Electronic decluttering - My Pictures - all neatly catalogued into folders by occasion, type, or subject. Also electronic - I considered switching from Bloglines to Google Reader, but I love the interface on Bloglines and the way I can organize it. I deleted 18 blogs from my feeds, though, you know, the ones you might read sometimes. Well, I just don't have time unless it's something I really love. I can always add them back later if I change my mind, but it felt good to clean it up. I also received Good Mail this week! This Halloween/Fall scrapbook kit and Paper Crafts magazine arrived from Kimmy at Stamps, Scraps, and More. This totally rocks because I was preparing to do a Halloween page of my twins, and I can use all the help I can get. Totally by surprise, I received this magnetic not pad from Mamarazzi of Dandelion Wishes. She must know me well, because I love to put a shopping list on the refrigerator that everyone can add to during the week as they think of things they need. You're awesome, Mamarazzi! This is the final day to visit my Bloggy Carnival post for your chance to win a $20 Amazon.com gift card. And it's a good thing I wrote this post a couple of days ago, even though I am posting it today, because I have been so sick! I think my head is going to explode, I about passed out at the doctor's office when they tried to take my blood pressure, and my throat feels like Freddy Kruger has been scraping it with his long, icky nails. Thanks for listening to me whine! Doesn't decluttering feel good! Nothing like seeing an organized nook. Happy Halloween. Sorry to hear your not feeling so well. You are so organized, you are amazing!! Feel better! I hate that you are feeling so cruddy. Heal my new friend today. We never like feeling yucky but on Halloween when we know there will be tons of little ones at our door! AND right before the weekend. Heal her FAST! hoping your feeling well soon. get some rest. Bless your heart! I must admit though, that I am quite impressed with your ability to de-clutter even while you are sick! I sure hope you feel better soon! Decluttering is so freeing, isn't it? I'll be visiting the special Friday edition to help me get organized. Thanks for the tip! Praying you are feeling better. i am glad you liked your good mail. i love sending it! I hope you are feeling better Diane, your decluttering looks wonderful.